Kick off your visit on the 5th (Thu): hike along Ecocentro Danaus, hike along Arenal Natura Ecological Park, and then take in the natural beauty of Paradise Hot Springs. Inspirock's itinerary builder makes planning a La Fortuna de San Carlos trip simple and quick. Birmingham, USA to La Fortuna de San Carlos is an approximately 12.5-hour combination of flight and shuttle. You can also do a combination of bus, flight, and shuttle; or drive. Finish your sightseeing early on the 5th (Thu) so you can travel to Manuel Antonio. Kick off your visit on the 6th (Fri): let the river carry you with a rafting and tubing tour and then enjoy the sand and surf at Playa Biesanz. Get ready for a full day of sightseeing on the 7th (Sat): stop by Beso Loco Boutique de Playa and then scramble along the landscape with a canyoning and rapelling tour. For reviews, ratings, more things to do, and more tourist information, refer to the Manuel Antonio day trip planning website . You can do a combination of taxi and flight from La Fortuna de San Carlos to Manuel Antonio in 1.5 hours. Alternatively, you can drive; or take a shuttle. Cap off your sightseeing on the 7th (Sat) early enough to go by car to Uvita. On the 8th (Sun), tour the pleasant surroundings at Uvita Beach, then identify plant and animal life at Alturas Wildlife Sanctuary, then get a new perspective on things with Boat Tours & Water Sports, and finally look for gifts at Discount Liquor Wine & Cigars. Here are some ideas for day two: get interesting insight from Tours. 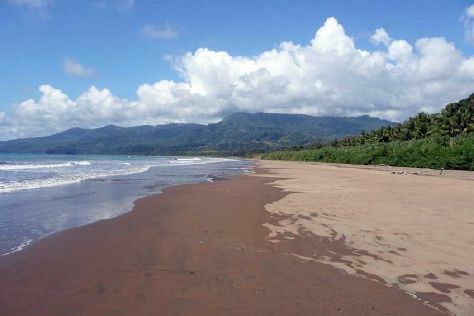 Plan my trip to Uvita with suggested itineraries provided by Inspirock. Traveling by car from Manuel Antonio to Uvita takes 1.5 hours. Alternatively, you can take a bus. Wrap up your sightseeing by early afternoon on the 9th (Mon) to allow enough time to travel to Santa Teresa. On the 10th (Tue), glide peacefully along the water with some of the best stand-up paddleboarding in the area, relax and rejuvenate at some of the top local wellness centers, and then stroll through Playa Hermosa. For where to stay, photos, reviews, and other tourist information, use the Santa Teresa trip planning site . You can do a combination of ferry and taxi from Uvita to Santa Teresa in 4 hours. Other options are to drive; or do a combination of bus and ferry. Finish your sightseeing early on the 10th (Tue) to allow enough time to travel back home.